Benz-Bavarian Duffield and Surrey Health – the two teams that contested last season’s final – top the Group A and B tables in the Premier Squash League at the half way stage. South African Stephen Coppinger clinched a 3-2 away win for former champions Duffield over University of Birmingham when he beat experienced Englishman Chris Ryder in straight games in the top string decider. Ryder, a 33-year-old former world number 33 from Leamington Spa – and the World University champion in 2006 – surprised the crowd by announcing his retirement from professional squash after the match. The fifth round win extends the Derbyshire club’s Group A lead to 16 points head of nearest rival Coolhurst London. “I’m pleased to have a good lead going into the Christmas break,” said jubilant Duffield team manager Felix Frixou. “The team did really well, especially without our long-standing number one Nick Matthew, who only arrived back today from Hong Kong where his title success in the Hong Kong Open takes him back to number one in the world next year. A blistering 5-0 home win over Winchester takes title-holders Surrey Health back to the top of the Group B tables – overtaking west country rivals Exeter Diamonds – who suffered their first defeat of the season, going down 3/2 to Team Chichester away from home. Surrey Health number four Tim Garner celebrated his 25th consecutive season in the league with an impressive straight games win over 23-year-old full-time player Phillip John Bull. 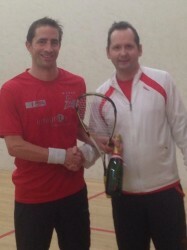 Garner was presented with a specially-engraved bottle of champagne by team manager Smith. “I still remember making my national league debut at Bromley Town all those 25 years ago – at the time so excited to have the chance to play in the top league,” said 43-year-old Garner, a former world No26. “And it’s brilliant to still have that chance a couple of decades on, though it is still disconcerting when you play someone who wasn’t born on your debut! Chichester celebrated their win over Exeter after the first three matches – with wins by Robbie Temple, Olivier Pett(over long-time coach and ‘birthday boy’ Tim Vail) and Jaclyn Kemp ensuring the Devon club’s first defeat of the season. The other Group B tie also saw a comprehensive 5/0 win when Luxfords St George’s Hill snatched an away victory at UWE/Elitesquash Bristol. The win sees the Weybridge club share second place in the tables with Exeter – both just five points adrift of Surrey Health, on 71 points. League newcomers Coolhurst London hold onto second place in Group A, despite going down 3/2 to Chapel Allerton. There was everything to play for when the Leeds club’s Chris Simpson took on the visitors’ aptly-named Steven London- and won 11-1, 11-6, 11-4 to clinch victory for Chapel Allerton. But just a single point behind Coolhurst are former champions Air-IT Nottingham, who crushed Yorkshire visitors AJP Pontefract 5/0. It was Nottingham’s in-form Emma Beddoes who put the hosts ahead with an 11-9, 11-4, 13-11 victory over higher-ranked English rival Sarah Kippax. Former Sun, Mirror, People and Sunday Express sports executive. Knows a bit about newspapers and the art of talking a good game. Brighter than some but a way to go to match others.